Ben Foden has warned Saints that they can’t afford to go into their shells at the Ricoh Arena today (kick-off 3pm). And the England full-back wants his team to fight fire with fire when they face a Wasps team who are one of the in-form sides in Europe right now. The Coventry-based club have claimed nine wins from their past 10 games in all competitions, earning a try bonus point in each of their past three Aviva Premiership matches. But Foden is determined to help Saints go there and impose themselves on Wasps, rather than the other way around. “We can’t go into our shells,” Foden said. “There’s no point in approaching the game with a defensive mindset, we need to get out there and play some positive rugby. “We’re definitely capable of scoring great tries. “We’ve got George North back from Wales and if we can get the ball to him in space he’s going to cause any guys problems - it doesn’t matter who they are. But Foden’s respect for Wasps is clear and he knows the damage they can do, having seen his side dismantled by them at the Gardens back in January. The 30-year-old missed that 24-11 defeat as he travelled to Finland for a holdiay having been given the weekend off by the Saints coaches. But he has seen enough of Wasps this season to recognise the threats they pose. “They’re one of the best teams in Europe at the moment,” Foden said. “You look at the teamsheet and names pop out - the Piutau brothers, Wadey (Christian Wade) is on form again, Jimmy Gopperth is doing great things. “They’ve obviously got George Smith there and he’s playing like he’s 25 not 35 so they’re a team very much in form. “But they’re 15 guys at the end of the day and they’ve got their weaknesses, they make mistakes. “We’ll look at them and they’ll be very confident having beaten us at Franklin’s Gardens earlier in the season, but we’ve got to go there and aim to get something out of the game. The game at Wasps is part of a season-defining run of fixtures for Saints, who will go to Saracens for a Champions Cup quarter-final next Saturday before hosting local rivals Leicester Tigers a week later. And Foden said: “It’s quite crazy really, especially when you’re trying to organise your summer because if things don’t go our way we finish on May 7 and if they do, we’ll be playing until the end of May. “We’re alive in all competitions - just. 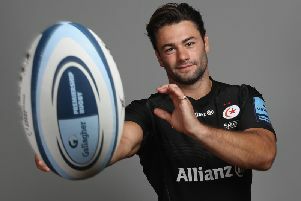 “We scraped in through the back door in Europe and we’ve got a tough game at Saracens coming up. “And hopefully we can sneak in the back door of the Premiership because we saw last year with Saracens winning from fourth that it’s not impossible to do. “If we can get ourselves into those spots with the right momentum behind us, we’ve got the calibre in our team to beat anyone on our day. “Hopefully we’ll get some good results and have a great end to the season. “We’ve got some big tasks, but we believe that we can do it. “Momentum has shifted in our favour and we’ve started to win some close games, the ones that at the start of the season we were coming out on the wrong side of. “When games have been close we’ve been able to muscle over. “As a player, you get a feeling that we won’t lose this one and that’s something I’ve felt when I’ve been playing.